HOUSTON — Rockets guard James Harden repeated himself for emphasis, just in case his point of view wasn’t made crystal clear when asked about the latest slump ensnarling his team. The Rockets (9-10) have dropped back below .500 courtesy of an 0-3 road swing through Detroit, Cleveland and Washington, with those three losses following a five-game winning streak that appeared to signal a welcome turnaround. But the Rockets, who will host the Dallas Mavericks on Wednesday at Toyota Center, have hit the skids again, prompting Harden to declare that all is well despite the outward appearance of the exact opposite being the case. Injuries continue to take their toll, with guard Chris Paul (leg) and swingman Gerald Green (ankle) unavailable for the overtime loss against the Wizards — the Rockets’ second OT defeat on the road trip. With their depth compromised Monday, the Rockets were forced to play swingman Danuel House 28 minutes on the same day he was signed from the G-League. And even with defensive coordinator Jeff Bzdelik back in the fold following his brief retirement, the Rockets have yet to hit their stride defensively. They rank 25th in defensive rating overall after producing a woeful 121.9 defensive rating during their road swing. The Mavericks (9-9) have won seven of their last nine contests, doing so by constructing a stingy defense from a roster that has jelled faster than most anyone could have anticipated. Dallas entered Tuesday ranked eighth in defensive rating and has been downright stellar during its recent run of success, leading the league by allowing 100.9 points per 100 possessions. Rookie forward Luka Doncic (607) and veteran center DeAndre Jordan (581) rank first and second on the Mavericks in minutes, both added to the roster during the offseason. 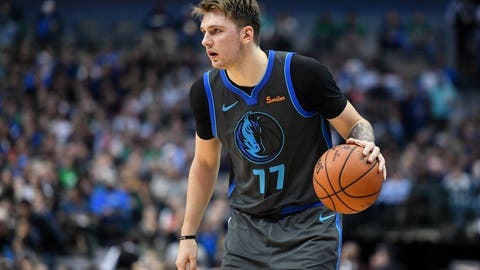 That Dallas has managed a viable offense with Doncic leading the way in assists (78) while trailing only veteran guard J.J. Barea in usage rate (25.9 percent) speaks well of its cohesion. But the Mavericks have made the most progress defensively. That remains their central focus. Whether the Mavericks can pack their defense and take it on the road with them remains to be seen. Dallas has won six consecutive games at American Airlines Center but is 1-7 on the road. The Mavericks might get a boost in Houston with guard Dennis Smith Jr. likely set to return from a sprained right wrist that sidelined him Saturday against the Boston Celtics. Reserve center Dwight Powell (left knee effusion) could also return from a two-game hiatus. “I know the way we’re playing now, we’re going to do a little bit better on the road,” Barea said.